American Foundation for Suicide Prevention Along with Mayo Clinic, Releases a New, Free Resource - "After a Suicide: A Toolkit for Medical Schools"
NEW YORK, Sept. 17, 2018 /PRNewswire/ -- Despite having resources, medical education, and access to healthcare, the rate of suicide among physicians is higher than for the general population. Today is the first ever National Physician Suicide Awareness Day. To help medical schools with suicide prevention and postvention resources, the American Foundation for Suicide Prevention (AFSP), the nation's leading organization dedicated to suicide prevention, and Mayo Clinic launched a new version of After a Suicide: A Toolkit for Medical Schools. The first version of this toolkit was launched in 2016 and focused on reaching residency and fellowship programs. "Our hope is always to have the student wellness training and counseling resources in place to prevent this type of tragedy. But we know from a national perspective, mental health issues and suicide among medical students continue to be a concern. Our goal is to provide a national framework by which medical schools can provide guidance and coping support for those impacted by a student suicide," said Liselotte Dyrbye, M.D., MHPE, professor of medical education at Mayo Clinic College of Medicine and Science. 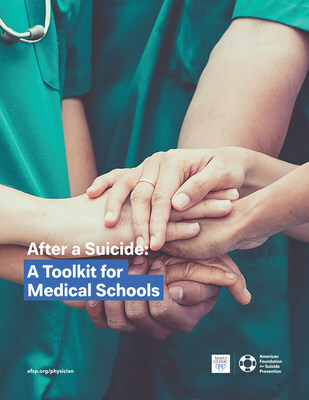 The free toolkit includes best practices for how medical school administrators and staff should respond after a suicide death of a medical student, with guidance on helping students and the entire medical school community cope, communication with family, and working with the community—including the coroner's office, local police departments, funeral directors, faith leaders, and mental health professionals. It provides tips on working with the media, tools for deciding how to safely memorialize students, and sample social media messages. Also included in the toolkit is important information on how to identify and support other members of the community who may be vulnerable and reduce the risk of suicide contagion. "Physician, trainee and medical student mental health and wellbeing, and suicide prevention are critical issues to address. This customized postvention toolkit for medical schools is an important component in any medical school's strategy to support students' health and professional growth. Although the focus is on postvention, the appropriate and sound handling of the aftermath of a suicide often paves the way for effective prevention strategies to be developed and employed at the next phase after the grief period. And because suicide loss survivors can develop elevated risk of suicide if not appropriately supported, postvention is in fact, a critical component of suicide prevention," said Dr. Christine Moutier, AFSP chief medical officer. Dr. Moutier will be participating as a guest on a Facebook Live session today, on Monday, September 17 at 3PM EST through the American Association of Suicidology's Facebook page (https://www.facebook.com/AASuicidology/). Dr. Moutier began working in the field of suicide prevention after losing colleagues to suicide, and is one of the nation's experts in suicide prevention for physicians. Developed by top suicide prevention experts and peer reviewed by academic and clinical professionals, After a Suicide: A Toolkit for Medical Schools is intended for medical school personnel and administrators.